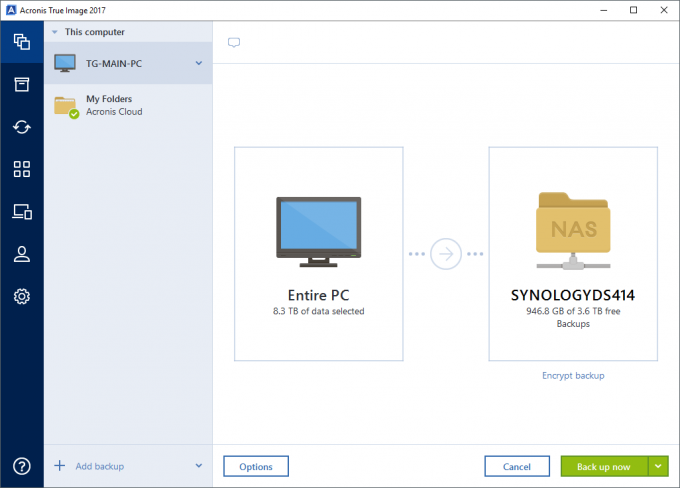 The latest version of Acronis’ popular True Image backup suite has arrived, and as we find out, the 2017 iteration includes a lot of refinement, as well as a slew of new features. 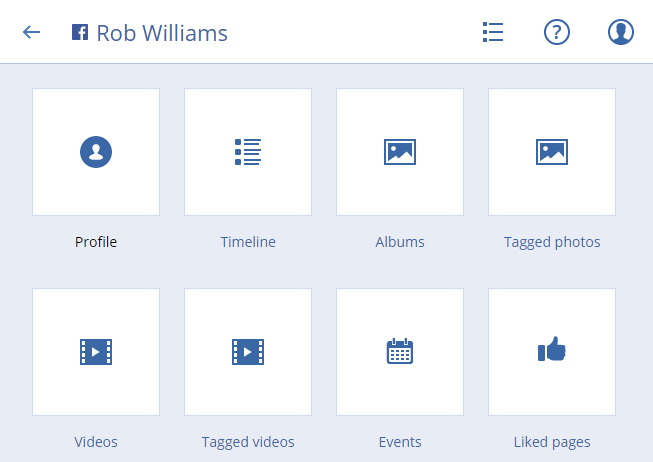 Included in those new features is Facebook backup, remote backup management, personal archives, a refreshed Web portal, as well as enhanced NAS detection. Let’s take a look. 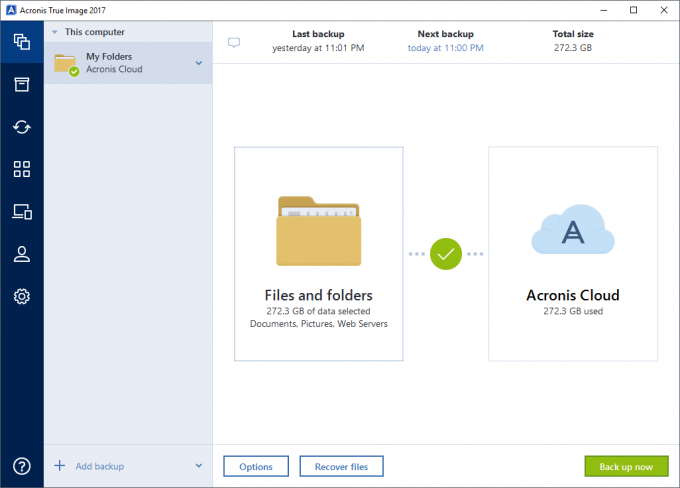 As we wrote about a couple of weeks ago, Acronis is back with a brand-new version of its popular True Image backup suite, and as this article suggests, we’re going to take a deeper look at it here. 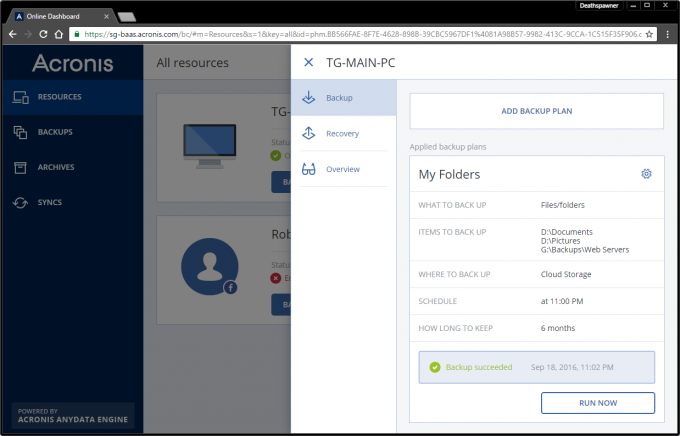 Since we took our first in-depth look at Acronis True Image way back in 2010, the Techgage team has relied-upon it for some of our important backup needs – the most popular scenario being the backing up of our test PCs. While we haven’t always taken a hard look at the latest version of True Image, we’ve continued to use each one. 2017’s version adds so much to the package, that we’ve decided to break our Acronis review drought with this new version. For those unfamiliar with True Image, it’s a software suite designed to keep your important data backed up, whether we’re talking about photos and documents or an entire operating system. That latter point could do with some additional explanation, as backing up an entire OS seems simple on the surface. What True Image is able to do is capture all of the bits related to an OS, so that in the event of a disaster, you’ll be able to get back up and running as quickly as possible. What makes this really useful is that you can backup the OS incrementally, so if a problem has existed for a few days, you could simply revert to an even older backup. As with most aspects of True Image, this feature is very customizable so that you can make the best use of the disk space you have. With True Image 2017, a great feature that ties into PC backups is the ability to control those backups remotely. If you’re at work, or simply out-and-about, you can log into your Acronis account to check up on your backups, edit them, and even force a fresh run. 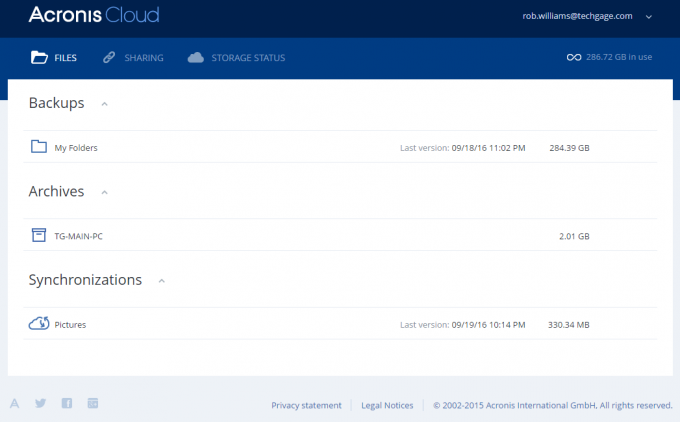 Accessing these backups is as easy as going to cloud.acronis.com and logging in. This leads me to my first and only complaint about this feature: I wish Acronis’ online services were a bit more streamlined. I went to Acronis’ homepage and logged in using the “My Account” option up top. When doing so, it just gave me information about the account, and how much space in Acronis Cloud I was using; nowhere was an option to go to the actual cloud account. Clicking on the small gear in the top-right corner of a backup will give you a couple of options – even one to recover. You can of course edit the backup’s details, including which folders are backed up, when the backup will take place, and how long to keep the oldest backups (default is 6 months). While in the example above I’m using Acronis’ Cloud service as the backup location, you can use local or network-attached storage just fine. Another nice (but not so obvious) feature is that you can also enable notifications on your backups. It’s not often that a backup will fail, but sometimes it can, and it’d be nice to know about it as soon as possible. You might have noticed in the shots above that I had a backup listed with a Facebook logo. That’s for reasons you’d expect: Acronis now lets you backup everything important on your Facebook account. If the usefulness of a feature like this doesn’t seem obvious, picture this: Facebook accounts get “hacked into” all of the time, and sometimes, that results in the purging of content. In that event, no one can help you – not even Facebook itself will be able to regurgitate the content. Or, it could be that you simply want to keep a backup so that you always have local copies to look through; whatever the reason, if you’re a Facebook devout, this feature should prove useful. Unlike the regular data or entire OS backups, Acronis currently has the Facebook backup feature restricted to its cloud service. This could be due to the fact that so much information needs to be pulled down (and it’d be quicker from its own servers), but it’s a little disappointing nonetheless. 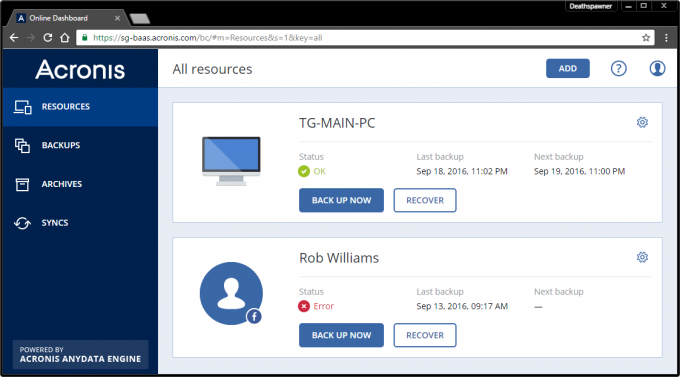 However, once the data is backed-up to Acronis’ own server, you can download it to your PC through the Acronis Cloud website. The Facebook API doesn’t allow all user data to be pulled from its service, so Acronis can only include what Facebook itself lets it. Fortunately, everything truly important is included, from status posts to videos and pictures to events. As with regular backups, you can pick and choose which items to back up. Use more than Facebook? Acronis told us that it’s looking into supporting other social media accounts in the future. This Facebook addition is used as a primer, so if you’re a fan of this feature, be sure to let Acronis know about it. We all have files scattered around our computers that don’t get accessed often, whether it be documents, photos, music, or whatever else. At the same time, a lot of us could do with freeing up some space on our hard drives – so what to do? Use the archive feature in True Image, of course. The Personal Archives feature will create a literal archive (.tia file) that can be viewed in Explorer, Finder, or through the Web. Acronis can find all of the files you don’t use too often, throw them all in a singular archive, and then let you peruse it later on. The example above is nonsensical as I set it to the root of a hard drive, but you can get a feel for how thorough it can be. Once a scan is complete, you can sort by category and then pick and choose what you’d like to archive. In the event that you want to archive absolutely everything, you can do so, and a file will be created. As a whole, this feature is actually quite simple, and should only be considered to be used if you don’t want really quick access to old data. If you’re to create more than one of these archives, you might find it tedious to go through each and every one to figure out where an old file you want is located. Sadly, you can’t create incremental archives – that’d be a nice future feature. As we’d hope for with any iterative software release, Acronis’ True Image 2017 is packed to the gills with refinements and enhancements. One of the most touted new abilities is NAS detection. While it was possible to backup to a NAS with True Image in the past, it required users to search through the network inside of the app to get there – a bit tedious for those who would prefer things be kept simple. Now, your NAS will come up in the list of different targets to save to, as seen in the shot below. If you’re someone who takes a lot of videos and photos on your phone, you might be interested in the updated mobile app. After opening the app and scanning a QR code, absolutely no further authentication will be necessary. From there, you simply choose what you want to backup, change the destination if you want to, and then tap a button to backup. The process will go as fast as your wireless connection will allow. Want to backup your calendar, contacts, and messages? You can do that with this app, too. 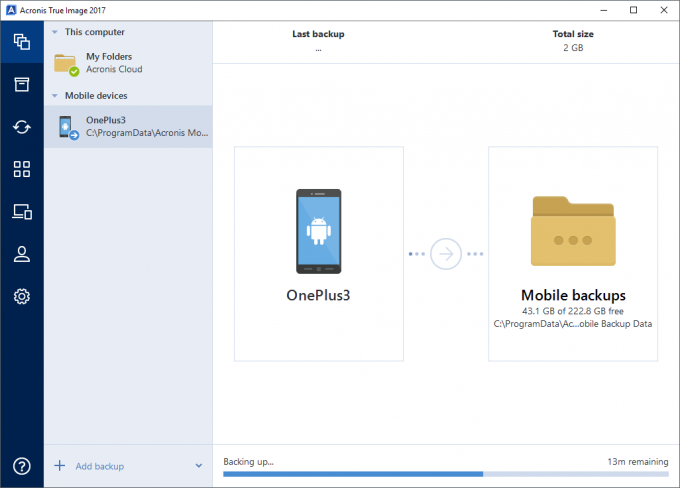 After a backup is completed, you can use the same app to view the files inside of it, and then delete the now-redundant files from the mobile device (which is really the entire point here, unless you’re simply looking to backup). I am not sure if I’d personally use this feature since barely 10% of the photos I take I want to actually keep, but for those who want to back it all up in one fell swoop, I feel like the process couldn’t be any easier here. As someone who hates logging into services on mobile, I loved the super-easy setup – no passwords, just a QR code scan. As with all Acronis releases, the latest version of True Image supports the latest hardware on the market. This even includes PCIe-based SSDs, although as I don’t own one, I was unable to test the software out with it. If you happen to use the bootable media like I do, you can rest assured it has been updated with the same hardware support. True Image 2017 is the seventh version of the software I’ve used, and it is without question the best (as one would assume). While it’s always hard to justify upgrading from one piece of software one year after another, you’ll have to do your own weighing of the options to see if it’s worth upgrading from 2016 to 2017. If you’re a True Image user and haven’t upgraded in a while, 2017 makes for a great time to move on up. When TI 2015 was first released, its overhauled UI left a bit to be desired. It looked good, but it felt a little sluggish, and perhaps buggy. Fortunately, Acronis has made great strides in refining the interface since then, and in all my testing with 2017, I didn’t encounter a single real issue. Creating and deleting backups worked as I’d hope, and so too did all of the backup processes I tested out. My biggest complaint with this release isn’t so much specific to the Windows software, but instead Acronis’ website. As I alluded to earlier, Acronis separates its two major portals; its account section is completely separate from the cloud one. I hope that in the future Acronis merges these together so as to make for a more streamlined experience. Beyond that, there is even an extra portal to enter after clicking “Online Dashboard” from within the app. Clicking that brings you to the homepage of Acronis Cloud, but then if I click on the link to view my cloud backups, I need to log in again. Even if you use a password manager like LastPass, that’s a bit annoying. Fortunately, those are issues that can be fixed as time goes on, and neither of them are deal-breakers – not even close. As you can probably tell, True Image 2017 is a solid release, and it’s one that’s going to keep me using the program. As a whole, True Image is a backup solution I’d wholeheartedly recommend to anyone who needs reliable, comprehensive backups – and that’s everyone. Before I wrap this up, there is one other thing to talk about: the price. Up to this point, Acronis has only ever sold one-off editions of True Image, but with 2017, a new subscription model is being introduced. If you’re familiar with Microsoft’s Office 365 or Adobe’s Creative Cloud, then it’s easy to understand Acronis’ subscription. Here’s how it works: for $49.99, a stand-alone version can be had. It includes email and chat support, but it’s not guaranteed to be given new features; however, the license won’t expire. Conversely, the subscription option costs $39.99 and will get new features over time, as well as some other perks, like phone support and the ability to upload to Acronis Cloud. For the first year, that $39.99 includes 500GB of cloud storage – a $20 value. Obviously, the best value now is with the True Image subscription, although that assumes you always buy the new version anyway. If you don’t, you might still be best off with the stand-alone version, and then just upgrade every few years to keep current. Whatever you do, you’ll have a very reliable backup solution at-the-ready. 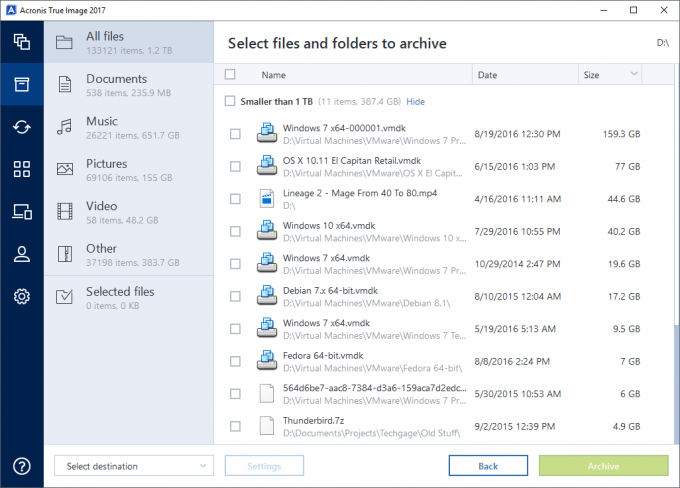 Can backup small data, entire OSes, and even mobile devices. Supports the backing up of your Facebook account. Remote backup management could be very useful to some. Supports the backing up of Linux partitions (though the software can’t be used in Linux). Bootable media creator is a boon for those who need to backup and restore entire OS images. Can restore OS images to dissimilar hardware. There are three Acronis account Web portals a user will need to use; merging them would be great. The ability to delete from an archive would be nice, as would be the ability to create iterative archives.